Every solar PV installation starts with an in-depth discussion with the customer to determine their needs and confirm that their property can allow a configuration to meet those needs. 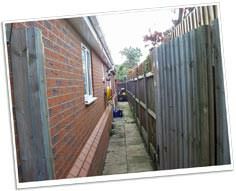 A detailed quote is then supplied to the customer. Upon receiving the signed acceptance form and deposit (all deposits insured), a convenient date is agreed on which to arrange an energy audit (an Energy Performance Certificate rating of D or better is required to receive Feed In Tariffs at the highest rate) and subsequently start the installation; and the solar panels, inverter(s) & supporting equipment are ordered. The first stage of an installation starts with erection of scaffolding to provide a safe platform from which to install the solar panels. Select tiles are then carefully removed and cables and supports put in place. The solar panels can then be installed – this requires great care as the panels themselves are both heavy and awkward to handle on the sloping roof surface at height, Wind etc! Solar panels cannot be switched off and are an electrical hazard if not handled carefully. 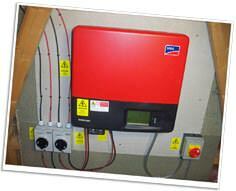 The solar PV inverter, associated wiring, meter(s) and isolation switches etc. can be installed in parallel to preparing the roof, and then the two systems connected together. A typical solar PV installation takes 2-3 days according to complexity. As soon as the system is up and running we carry out checks to ensure that the systems are operating safely as expected. 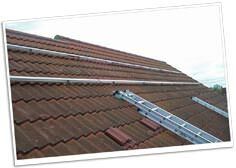 We are very particular to remove all installation and packaging materials from site before we leave – we even clear the gutters below the solar panels to clear up any moss/material we have disturbed whilst working on the roof! 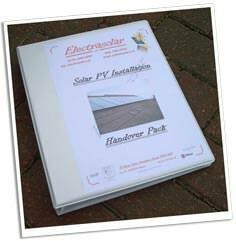 We will talk you through the system and leave you with a full solar PV installation handover pack with instructions, all the certificates required to claim your solar PV Feed in Tariff (FiT), guarantees etc, and walk you through the claim process. After installation we’re happy to answer any further questions that our customers might have and help with the process of registering to receive the FiTs. We use remote monitoring (if installed) to check everything is running smoothly for all our customers from time to time! If you have any questions on the installation process then please do get in touch.